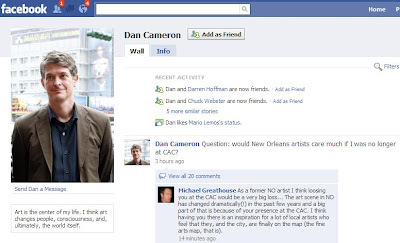 New Orleans Art Insider: Breaking News: Dan Cameron Leaving CAC??? Breaking News: Dan Cameron Leaving CAC??? Is Dan Cameron leaving the Contemporary Arts Center? His Facebook Wall asks: "Would New Orleans artists care much if I was no longer at CAC?" Are you kidding? This doesn't sound right. What's the back story? No it does NOT sound right. What is the FEONT STORY ??? Check out today's TP story. He got the boot. You don't have to read very far between the lines of what the director says to see why. I wouldn't place any bets on there being a Prospect.3.